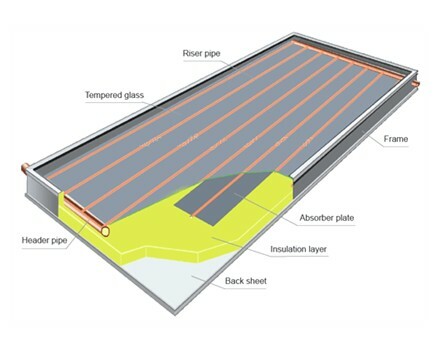 How Do the Flat Plate Solar Collector works? the tank is gradually heated. 1) Cover a window on heat pipe solar collector, has better appearance. Flat plate solar collector is a metal box with a glass cover (called glazing) on top and a colored absorber plate at the middle.The sides and bottom of the collector are usually insulated to minimize heat loss.Sunlight passes through the glazing and strikes the absorber plate, which heats up, changing solar energy into heat energy.The heat is transferred to liquid passing through pipes attached to the absorber plate.Flat plate solar collectors are an excellent solution for your solar hot water heating requirements. Utilize the power of the sun to heat your domestic hot water. JinYI flat plate collectors are also suitable for commercial applications including residential buildings,car washes, and boiler systems.flat Plate collectors can be integrated with your existing hot water system to accommodate up to 80% of your hot water requirements. In addition to domestic hot water system, our collectors may also be used in radiant floors and base board heating systems.Solar Flat Plate collectors are typically recommend for use in warmer climates simply because they are designed with larger absorber areas that are not insulated from the colder weather. The JinYI vacuum tube solar collector prove to be more efficient in colder climatesand are recommended for use is these areas.